Gridlines in Excel are those faint gray lines that you see around the cells in the worksheet. These gridlines make it easier to differentiate between the cells and read the data. Now don’t confuse gridlines with borders. Gridlines are visible on the entire worksheet while borders can be applied to the entire worksheet or to a selected region in the worksheet. You can change border settings such as color, width, style, etc., but in the case of gridlines, you get limited options to change the look of the gridlines. How to remove gridlines from the entire worksheet. How to show gridlines in a specific area in the worksheet. How to change the color of the gridlines. How to print the gridlines. In the Sheet Options group, within Gridlines, uncheck the View check box. 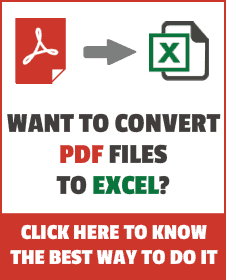 This would remove the gridlines from the Excel worksheet. You can also use the keyboard shortcut – ALT + WVG (hold the ALT key and enter W V G). This shortcut would remove the gridlines if it is visible, else it will make it visible. Removing the gridlines would remove it from the entire worksheet. This setting is specific to each worksheet. If you remove the gridlines from one worksheet, it would still be visible on all the other worksheets. You can also remove the gridlines by applying a background fill to the cells in the worksheet. If the gridlines are visible, and you apply a fill color in a specific area, you would notice that the gridlines disappear and the fill color takes over. Hence, if you apply the fill color to the entire worksheet, the gridlines wouldn’t be visible. (Note that you need to remove the fill color to make the gridlines visible). If you want to remove the gridlines from all the worksheets at one go, select the worksheets by holding the Control Key and selecting the tabs. You would notice that the workbook is in the Group Mode (see the top of the workbook where the name is displayed). Now change the gridlines view setting and it will be applied to all the worksheets. Make sure to Ungroup the sheets (right click on the tab and select ungroup) else all the changes you do in the current sheet would also be reflected in all the worksheets. By default, gridlines are not printed. In Excel, you can either have the gridline visible in the entire worksheet or hide it completely. There is no way to show this in a specific area. However, you can use borders to give a gridline effect in a specific area in the worksheet. Borders come with a lot of options and you can make it look exactly like gridlines (by selecting a light gray color). Note: Unlike gridlines, borders are always printed. 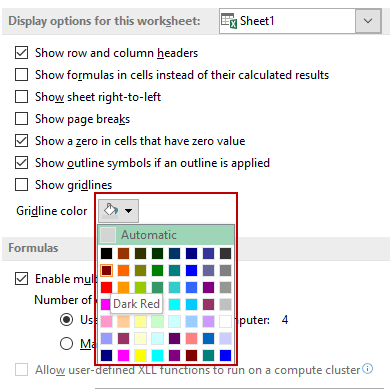 You can choose to have a different gridline color in your Excel worksheets. 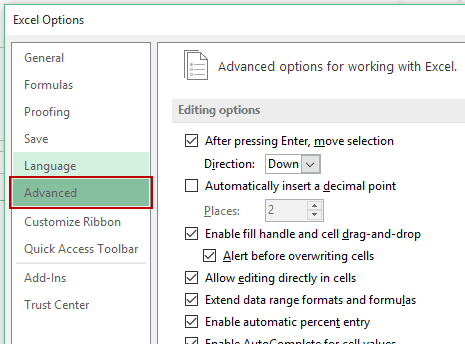 In the Excel Options dialogue box, select Advanced option in the left pane. Scroll Down to the section – ‘Display options for this worksheet:’. At the bottom of the section, use the Gridline Color drop down to select the color for the gridline. This changes the gridline color of the active (selected) worksheets only. If you want to change the gridline color of all the worksheet, select the worksheets by holding the Control Key and selecting the tabs. You would notice that the workbook is in the Group Mode (see the top of the workbook where the name is displayed). Now change the grid lines color and it will be applied to all the worksheets. Make sure to Ungroup the sheets (right click on the tab and select ungroup) else all the changes you do in the current sheet would also be reflected in all the worksheets. It doesn’t change the default color. The next time you insert a new worksheet or open a new workbook, it would still show the light gray color gridlines. In the Sheet Options group, within Gridlines, check the Print checkbox. While the gridlines aren’t printed by default, borders are always printed.